I didn't actually need another car, but I couldn't help myself as usual. On a Sunday late in November 01, I popped down to hooton park for their autojumble. Always like to have a trawl through the junk to see if there are any useful bits to be acquired, plus it means I can pop in to see old Bess, the Dodge bus, and pat her on the wing. Only the day before I had bade farewell to my characterful old Austin Somerset, so I was in a naturally weak position - pining over the fact that I must have been down to only 7 or 8 cars in the fleet, and a wad of the £folding stuff in my back pocket. Anyway, at Hooton they sometimes have a small area set aside for classic car sales, and, parked up along with a grotty Viva HC and tidy 1600E Cortina, sat a strange, low slung, sporty looking device. Further investigation was obviously required. It turned out to be a 1950s Ford-based 'Special', in this case an Ashley 1172 coupe. Sharing its engine with my pair of E83W trucks, I soon recognised the sturdy profile of the awe-inspiring 1172cc sidevalve powerplant, adorned with period tuning goodies courtesy of Aquaplane, front suspension setup courtesy of EB Components, a remote shift taken straight from the Woolner Accessory catalogue, and a myriad of other tweaks and nice touches - even down the repro period-style Dunlop crossplies (unused). Naturally I was having visions of filling the Somerset-sized hole on the driveway with this machine, but rather than diving in and buying it as I usually do, I went for a wander around the 'jumble to mull it over. Try as I might, I couldn't shake the shapely Ashley from my mind. A quick phone call to 'er indoors confirmed that I wouldn't be instantly shot if I brought another machine back to the stable, so following a quick haggle, I agreed to buy the little sports car, on the basis that the guy who'd brought it would drop it off at home for me. Further checking over illustrated that it also sported a natty pair of period (skinny) bucket seats, fantastically awkward pedal layout, nice optional water pump (its an E93A engine so didn't come with one as standard), racey rear wheel spacers, side exiting exhaust, Aquaplane exhaust manifold, and so on. The car needs some localised paintwork, and I may lower the wooden floor a tad so that I can prise my frame below the dash and steering wheel. The old girl seems to run a little rich too, so the Aquaplane MC2 motorcycle-sourced twin SU setup will need a little fettling to sort out. Plan is to get it sorted out for occasional road use, and dress it up as a late 50s racy road car, with period go faster goodies and the like. July 2003 Update: However as with most best laid plans, they didn't come to fruition in the end. With a housemove due imminently, the reluctant decision was made to part with one of the non-MOTd cars. Given that each non runner would need accomodation at the new home, and towing to it one by one, something had to give and it ended up being the Ashley that was sold. It went up on Ebay in the Spring of 2003 and attracted a lot of interest, finally being sold (as was the green Standard) to a gent in Germany, who was very keen to acquire it. He already owned mint examples of early TVR and MGA, so at least I knew it was going to a good home. The last time I saw the car was on a large trailer being hauled off to its new home behind a Renault Laguna. Saying goodbye to the Ashley wouldn't, however, be my last dalliance with these curious old Pop based Specials, as witnessed here .. with the chance purchase of a Nickri Champion. Back to the my cars section. "Hello from France ... I have a collection of English kit cars from the 50s/60's and my last acquisition is an Ashley Sportiva the same as yours with Wolseley 1500cc engine and gearbox. I wish to rebuild this car and some pictures of yours could be help me ! Do you think possible to mail me some pictures of it? ... the shell looks as new and never been fitted on a chassis ... 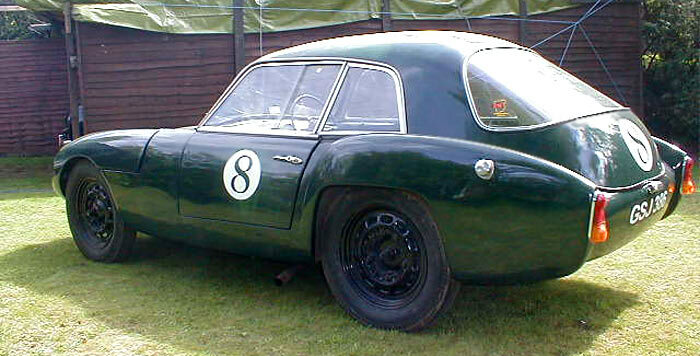 The chassis seems to be near to a Bowden chassis, built for 1500cc BMC engine and gearbox (Wolseley)." I emailed over some photos, so hopefully the restoration is progressing. The car shown, with its removable hardtop identical to the one I had, is in fact an 1172 coupe. 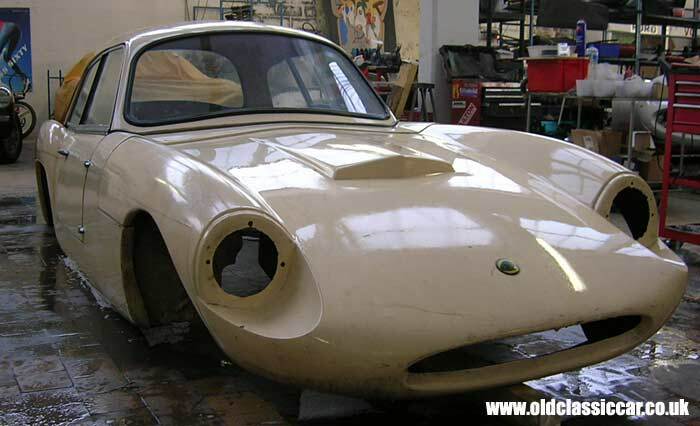 The Sportiva was a later re-working of the design by Ashley, giving the car a squarer front end, more similar in style to the post-Frogeye Spridgets of the early 1960s. This example also has a Lotus badge on it. Thanks to Patrice for the photo. In 2008 I heard of a super Ashley 1172 roadster now living in Italy, more on that car here.